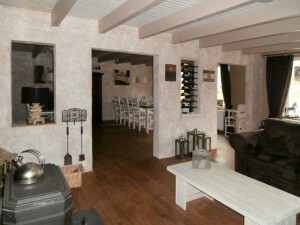 Bed & Breakfast La Tulipe is the place to be if you want to enjoy a few days in France. At La Tulipe you can rent a room for an extended period, but also for one night. We have 5 spacious guestrooms, all with a private bathroom. 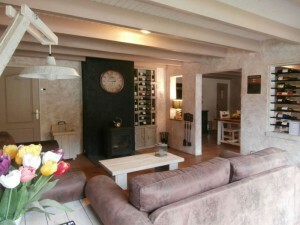 La Tulipe is a new property with a typical French atmosphere which radiates cosiness. Corna and JW, who live in France already since 2006, have realized a charming Bed & Breakfast in the French Vosges, where you can not only stay overnight but also enjoy a carefully prepared dinner . The area is densely wooded and ideal for hiking, cycling and motorbike tours. In the surroundings of La Tulipe there are also a great deal of tourist activities. But for those who just wants to enjoy France with a glass of wine and a rich meal, La Tulipe is of course also the right place to be. In winter you can also visit La Tulipe. Our accommodation is only a 15-minute drive from the ski slopes. Gerardmer and La Bresse are in winter cozy ski resorts, ideal for skiing with the whole family! You can also contact us for group arrangements up to 30 people. You want to organize something for your business or a cozy getaway with the family, La Tulipe can help you. We like to think along with our guests so therefore the possibilities are endless, as you yourself have a great idea and you are looking for a charming accommodation or location, please contact us. Check navigation button Group Arrangements.